Follow this link to find out where the cranes have been seen lately and how you can see them too! A wetland icon returns to Southwest England. Between 2010 and 2014, 93 common cranes were hand-reared to release onto the Somerset Levels and Moors - doubling the UK population, and helping to secure the future of the crane in the UK. The initial 6 year phase of The Great Crane Project is complete - with eggs collected annually in Germany from 2010 - 2014, transported to the UK for hatching and rearing, and subsequent release in Somerset. and they have a courtship dance that has to be seen to be believed. 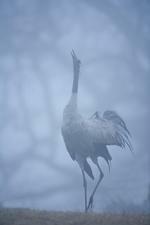 Before hunting and the draining of our wetlands wiped them out, cranes were plentiful and widespread in the UK. Cranes made a natural return to the UK in the late 1970's with the first fledged chick for 400yrs being produced in the Norfolk Broads in 1982. With a lot of conservation effort the population has grown and spread over the last 30 years with small numbers of cranes now also regulalry breeding in Cambridgshire, Suffolk, Yorkshire and North East Scotland. The Great Crane Project will continue to monitor and protect the released birds, and ensure suitable habitat is maintained and created to help re-establish former numbers in wetlands throughout the UK. Explore this site, watch Return of the Cranes a short film, Meet the Cranes, view the Crane Sightings Map and if you've seen the cranes in the wild, you can find out more on how to submit your sighting. and stories from the project team. Crane-inspired activities created for schools and groups. 'The Company of Cranes' is the work of artist Melanie Tomlinson, commissioned by Somerset Art Works (SAW) and The Great Crane Project, with funding from Arts Council England and InspirED.